In anticipation of Incredibles 2 coming out this week, I’d like to talk about the first film, and some of the events leading up to its initial release. In 1999 Warner Bros. animation studio released Brad Bird’s directorial debut, The Iron Giant. The film was loved by critics and has become a cult classic, but due to a lack of marketing it was a financial disaster. This resulted in Bird going to Pixar and Warner Bros. downsizing their animation studio and moving them out of their building. At Pixar, Bird and his team began work on a film he had the idea for years earlier, about a family of superheroes trying to cope with mundane, day-to-day life. 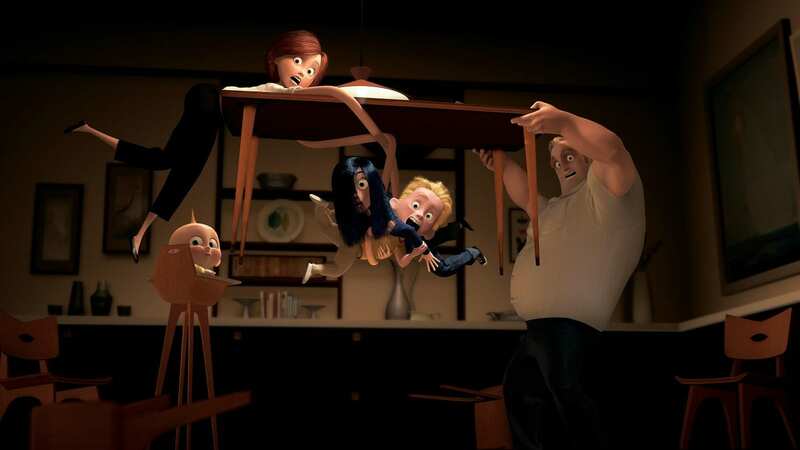 The Incredibles tells the story of Mr. Incredible (played with a paternal sympathy by Craig T. Nelson), one of the biggest superheroes in Municiberg, loved by the public and law enforcement. After a series of lawsuits against superheroes for everything from property damage to voyeurism, the government forces all the superheroes into hiding as civilians. 15 years later, Mr. Incredible is now lowly insurance claims representative Bob Parr. Beleaguered by an unpleasant job and family troubles with his wife Elastigirl/Helen Parr (given a lovable snark by Holly Hunter) and their three children, Bob jumps at the chance to get back into action when he receives a communication summoning him to a remote island. Being that vigilantism is now illegal, he lies to his wife saying that he has a work conference to attend. Once he arrives he’s introduced to his challenge, a giant robot called the Omnidroid. He dispatches it easily enough and is invited back. But all is not what it seems as his new employer turns out to be a figure from his past. 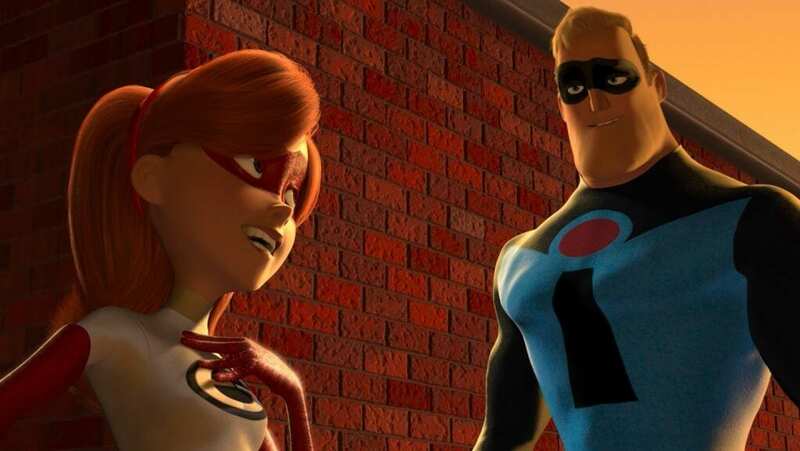 One aspect of The Incredibles that often gets lost in the shuffle is that it’s technically a period piece, with the bulk of it being set in the 1960s; Elastigirl’s feminist comments in her initial interview clue the audience in on this, in addition to the date on every newspaper in the film, the vehicles, technology and architecture. The story begins in the Golden Age of superheroes, and I just love the retro look and style of the film. The soundtrack by Michael Giacchino is just like something John Barry would have produced for a James Bond film; in fact Barry was originally intended for the job. The character designs are truly unique, suiting each character’s personality perfectly, and have Bird’s style written all over them. Bird has stated that he also chose each family member’s powers based on their personality and role: Bob has to be strong as the head of the household, Helen has to be flexible to keep her family together, Dash is a hyper young boy full of energy, Jack-Jack is unpredictable and full of potential and Violet is shy and uncomfortable in her own skin. The Incredibles is also very smart in terms of informing the audience how things work in this world. In the “Glory Days” sequence, Mr. Incredible looks at the oncoming train and winces before trying to stop it. These heroes may be superhuman, but they’re not immortal and they can get hurt doing what they do. Little bits of dialogue also inform us that the Super Relocation Program, instituted to help the supers hide and adjust to civilian life, is funded by taxpayer dollars. We even get some funny stuff about hero worship: Mr. 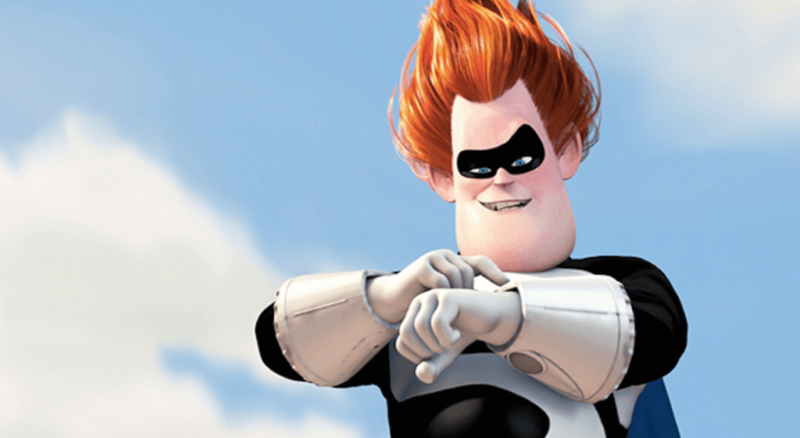 Incredible has a fanclub, and has to inform a particularly obsessive fan, Buddy, that “You’re not affiliated with me!” when he tries to become Mr. Incredible’s sidekick under the name Incrediboy. Later in the film Syndrome, the main antagonist, is revealed to be a grown-up Buddy who is no longer interested in idolizing heroes, but in replacing them by selling high-tech gear that simulates super abilities. The Incredibles has some of the most interesting themes I’ve ever seen explored on film, and I think one of the reasons this movie has resonated with me so much is the seriousness with which it treats its audience. There’s a running plot motif regarding those with special talents and how other people and the system seek to keep them down and make everyone equal, so to speak. When Helen says that everyone is special Dash retorts, “Which is another way of saying no one is,” which is later echoed by Syndrome about superpowers, specifically. In selling his high-tech weapons he wants to make supers obsolete by giving “normal” people that cutting edge, a goal that would be aided by the fact that he’s already murdered a great number of supers. You also have the more obvious theme of family, specifically relating to how Bob treats his. He’s so wrapped up in his need to do hero work and be recognized for his talents that he essentially ignores his wife and kids, retreating to his office within minutes of sitting down with them for dinner. In the “Glory Days” sequence when Bob’s getting married to Helen, she tells him that he’s got to be more than Mr. Incredible, a claim that he happily agrees with. But things like this are easier said than done, and settling down with his family isn’t quite as blissful as he expected. Only when he’s presented with the possibility of losing his family forever does he wake up and realize what he’s been missing out on. We also get some good stuff about bureaucracy and corporate greed with his job at InsuraCare, where he’s encouraged to screw customers over and not cover them, something he can hardly bear doing each day. My favorite element of The Incredibles is the characters and their relationships. Mr. Incredible is a good person at heart, wanting to help people in any way he can, even to his own detriment, but he gets a little selfish when it comes to hero work. He also seems to resent his wife at times, putting part of the blame for their situation on her. But Helen doesn’t want him to be unhappy; she just wants to keep the family together, and Bob doing illegal hero work is a direct threat to that. Although she says in the beginning that she doesn’t want to settle down, Helen adjusts the best to home life, giving the children the nurturing attention Bob is too distracted to offer. She also sympathizes with his discomfort in his job and encourages him to try hard. Plus she’s smart, tough and a certified pilot! These two are my favorite characters, but the kids are pretty great too, as is Frozone/Lucius, Bob’s best friend and partner in crime (no, literally; what they’re doing is a crime, remember). Frozone and Edna, the film’s Q-like designer of suits and gadgets, deliver some of the film’s best one-liners. Edna is voiced by Brad Bird himself to hilarious effect, and Samuel L. Jackson gives Frozone the cool delivery needed for the part. Essayist Sarah Vowell plays Violet as a snarky but shy teen, Spencer Fox is the mischievious Dash and baby Jack-Jack has two voice actors — Maeve Andrews and Eli Fucile — both babies of animators Mark Andrews and Tony Fucile. Jason Lee is hilarious as genius villain and petulant fanboy Syndrome, whose obsession I can understand on some level. In short, The Incredibles is not technically the best film I’ve ever seen, but it is my favorite. It got me interested in superheroes, and Mr. Incredible and Elastigirl are my favorite couple in a movie, ever. With influences like Superman the Movie and classic Bond I don’t see how you can go wrong, and Bird et. al. get The Incredibles so right. If I have any nitpick with this film it’s that some of the pacing is off, namely in the lightning-fast “Glory Days” prologue, as well as some bits that are difficult to hear or understand; the sound mixing can be a tad heavy over the dialogue at times. Nonetheless I think this film is incredible overall and I can’t wait to see the new sequel.